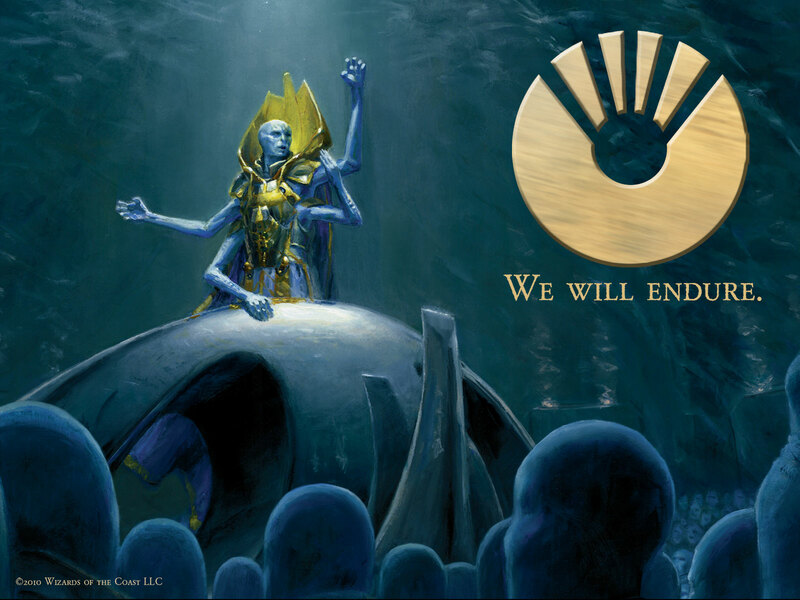 We already yattered about the Scars of Mirrodin Game Day going down this weekend but wanted to give you another reminder. 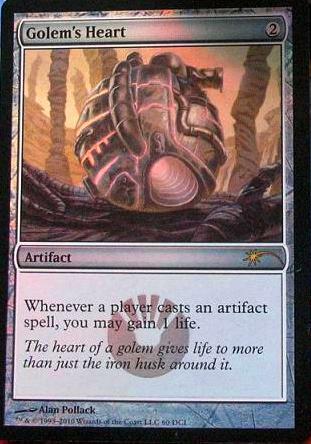 The most common question we're getting is how to score those Mirrodin Beseiged cards. 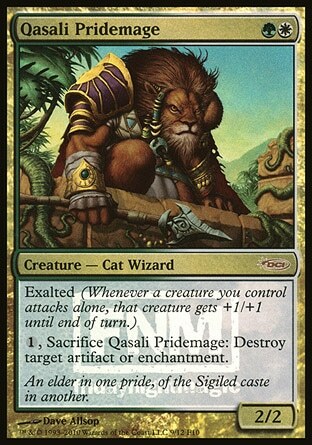 To get one of these cards, you bring along your standard-legal deck built with a minimum of at least ten watermarked cards from its affiliated faction in its main deck, and no watermarked cards from the opposing faction in its main deck or sideboard. 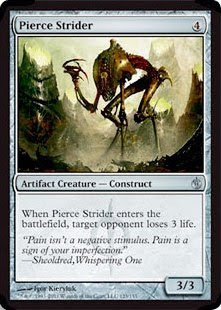 The top 2 finishers with Mirran-affiliated decks receive a Peace Strider preview card from Mirrodin Besieged, and the top 2 finishers with Phyrexia-affiliated decks receive a Pierce Strider preview card. This is in addition to any top 8 prize cards you might win for their overall event finish. 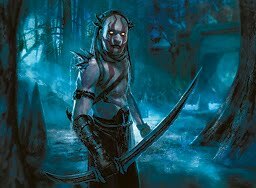 Some decent ideas for an affiliated deck to consider if you are thinking of scrapping together for Game Day . . .
Metal Craft : green / white featuring Memnite, Mox Opal, Darksteel Axe, Gold / Copper Myr, Indomitable Archangel, Ezuri's Brigade. Argentum Quest : Memnite, Ornithopter, Quest for the Holy Relic, Glint Hawk, Abuna Acolyte, Sword of Body and Mind, Argentum Armor. Anywhoos - All participants receive an exclusive Memnite promo card (while supplies last). 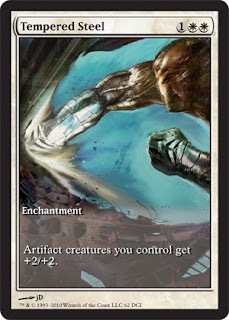 The top 8 players each receive an exclusive full-art Tempered Steel promo card. The cards are awarded to the Top 8 players even if the tournament cuts only to the top 4 so what more enticement would you need to head on out to your nearest games store . .
For details about Scars of Mirrodin Game Day or where and when you can at a location near you, swing on over to the Wizards of the Coast mother-site - HERE. Here today on MTG Realm, we will have a look at the very cool videos Wizards of the Coast had recently put out early this week. We have to admit that these two videos showcasing the latest Magic the Gathering set is awesome marketing and the best we've seen since the Ravnica trailer. The Mirran video feels epic, kind of Peter Jackson / Lord of the Rings sort of epic. The Phyrexia video is choked full 'o' fearsome dread, kind of Borg meets Tim Burton kinda creepy. The alien voice and script was pure genius. 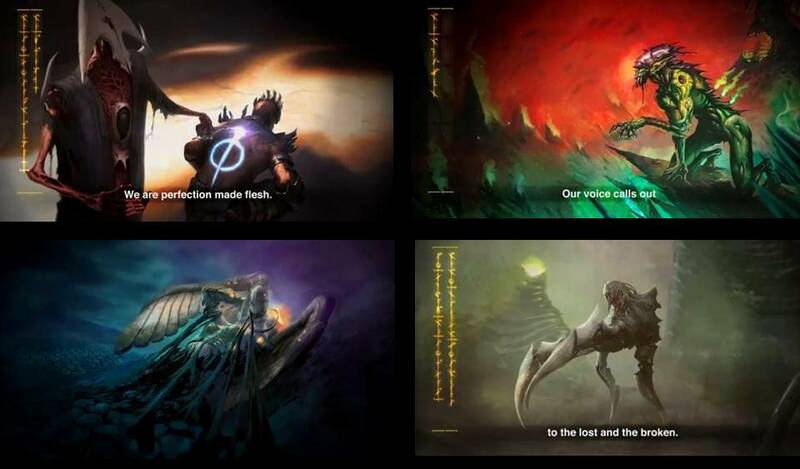 So, not only are we treated to some cool animations featuring new Scars of Mirrodin cards but also some previews of what can only be the upcoming Mirrodin Besieged set. 'Nuff rambling, pop some korn and let's have a look . 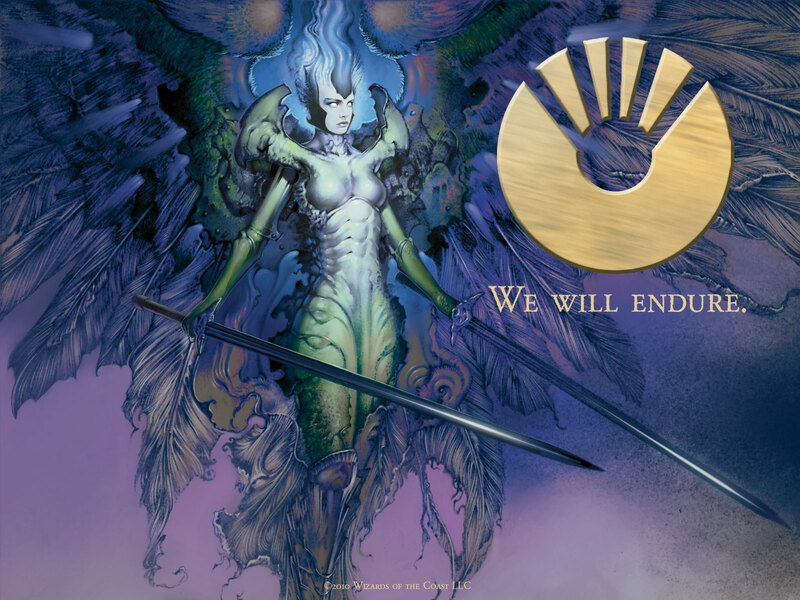 . .
"We Will Endure" is the battle cry of the Mirrans as they defend their home against Phyrexian invasion in Magic: The Gathering - Scars of Mirrodin. Join the Mirrans at this Facebook page. 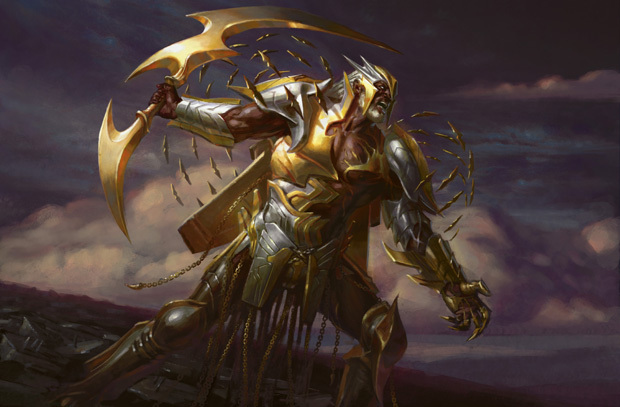 "All Will Be One" sums up the Phyrexian philosophy of conquest as they bring purity to the plane of Mirrodin in Magic: The Gathering - Scars of Mirrodin. 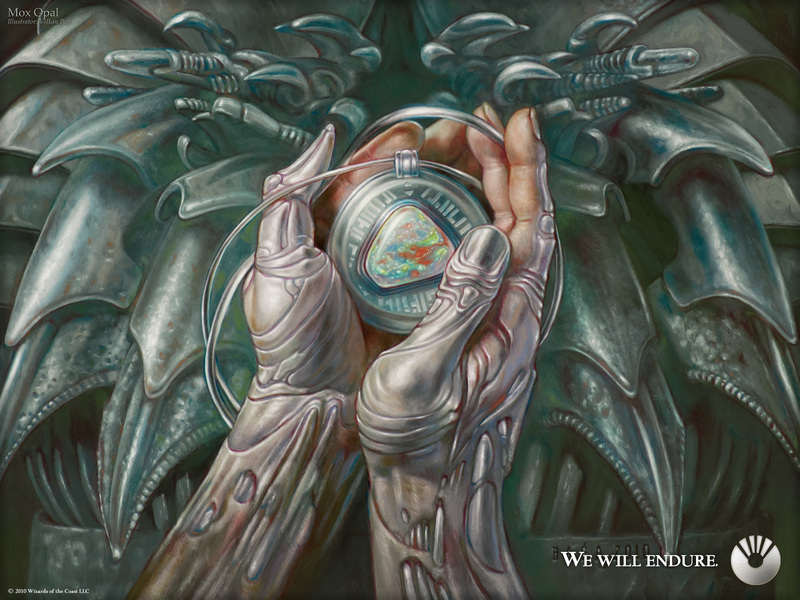 Support Phyrexia at this Facebook page. 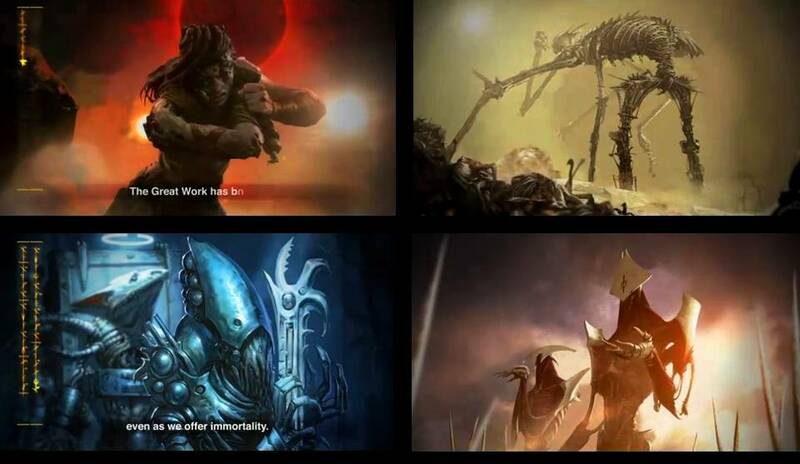 And here are some vid caps showing existing and unknown arts . . . 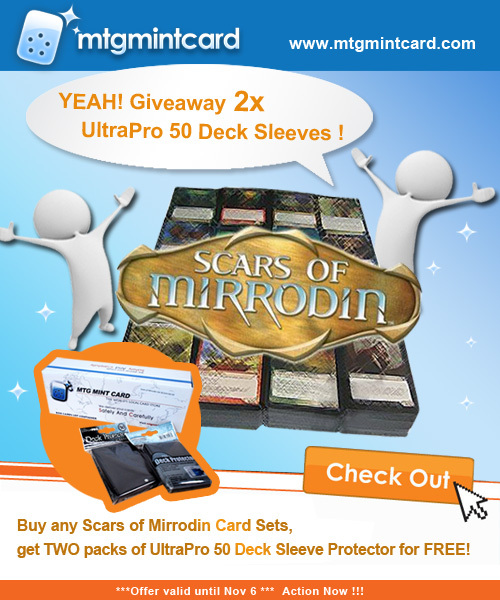 Finally - some news from MTG Mint Card - A decent deal where one may purchase any Scars of Mirrodin Card Sets, and score 2 packs of UltraPro 50 Deck Protector Sleeve for FREE. Move fast as this is good only until November 6th. Details here. FedEx guy : Yeah. How ya doing? erm . . . 'Copy' . . 'Six', umm . . 'MTG Realm' ? Me : Yep - That's me. FedEx guy : Good. Package delivery. Me : Dang that fast - I just got the on-line order confirmation from Fredericks of Hollywood yesterday. FedEx guy : Uhh . . nope. It's from Wizards of . . . umm Seattle. Me : (jumping) OMG, OMG, OMG - it's the Mirrodin Lunchbox ! Awesome Sauce ! OMG ! FedEx guy : yeah . . . OK. Right - sign here . . not 'copy' whatever - your real name please. Me : OK. Totally cool. I use CopySix as an on-line handle - there's a lot phreaks out there. FedEx guy : (mumbling quietly) There's a lot of freaks here too. Me : Sorry - what ? FedEx guy : Nothing - thanks. Have a great day. Me : You too. OMG ! - Mirrodin Lunch Box NOM NOM NOM ! You may recall our very recent post from last Friday. Wizards of the Coast sent MTG Realm some krazy kewl swag. Here's the Scars of Mirrodin Lunch Box full of sweet Magic the Gathering goodness and topped with awesome sauce. 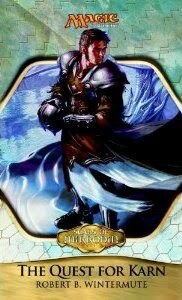 MTG Realm will be giving some of this away in future contests on the site. Here are the pulls from the packs which will be making its way down via a trade binder to Friday Night Magic : Chimeric Mass, Inexorable Tide, Kuldotha Phoenix, Memoricide, Molten Psyche, Myr Reservoir, Mox Opal, Precursor Golem, Shape Anew, Tempered Steel, Tower of Calamities and True Conviction. Today MTG Realm is yattering with Brett Parise, who operates the Magic on a Budget website. Why? Well not only is he a sponsor of MTG Realm but also a part of the Magic Community known to quite a few. Now residing in Orange County California, we've reached Brett to conduct a somewhat awkward but cool interview to know the fella. MTG Realm (MTGR) : Good Morning or Good Night Brett. We're not sure what time it is out that way. Magic on a Budget (MoaB) We could settle for "G'Day eh" don't you Canadians like saying that. MTGR : Correct Sir, Let's flow with that. So the first thing Magic the Gathering Players usually talk about is when they started playing. As you do a fairly decent bit of business with selling Magic Cards, I will assume you play. MoaB : Correct. I first started playing magic around 1995 when the revised edition came out. A lot of people were playing and talking about it so that Christmas my parents got me and my brothers some cards. Since then I have always played it as a hobby. More recently however I have been visiting a lot of FNMs and really enjoy the tactics and strategy behind it. MTGR : Very cool, Friday Night Magic definitely one night I do rather look forward too. Most times we get handed our buttocks but that just gets the creative juices flowing in developing strategies against the local meta-game. Anywhoos, enough of our fails, how about your success. When did you decide to go into business for yourself? Was it after a head-bump or did you just get sick of working as a drone in CubeVille? MoaB : Actually the decision to turn my hobby into a business was made a long time ago. I always thought I would be self employed and have even been supporting myself playing poker for almost a year. However the decision to transform my career from poker to magic cards was made late last year. While I still enjoy playing poker I find it more enjoyable to watch Magic on a Budget grow and become successful. MTGR : Wow. We're talking about a fairly diverse background with you here. Starting a new business takes a lot of guts, smarts and support. What sort of support did you seek out for your venture? MoaB : for support I always look to my family, who conveniently enough also happen to be my business associates. My older brother Rob helps me run the day to day operations of our small business. So you could say my family is definitely invested on the success of our venture. MTGR : That's excellent. I remember as I'm sure most people do earning their very first pay check. I remember getting $5 for cutting the neighbours lawn which I immediately spent on sugar. It must have been a moment to get your first customer order - tell us about that. MoaB : Our first customer wasn’t as memorable as many would think. It was a $150 order online for basically our entire mythic stock on our newest set. I never got to meet him face to face, but after that I knew that our prices and site was good enough to attract the more competitive players, which I had hoped would be the backbone of the site. MTGR : Very Good. I should think it takes quite a bit of dedication. MTG Realm has been online since early 2008 and we are now looking at getting our 3-millionith visitor onto the site sometime late December or early January. I really did think I would still be doing this MTG fan site thing this long but now that I have, I'm starting to develop long term goals. What about Magic on a Budget? Where do you see yourself in the short and long-term future? MoaB : Looking ahead to the next one or two years, the biggest goal really is expansion. After dealing in the industry for around a year, I have really got a renewed passion for magic cards and am glad I am in the industry. Once we receive that growth we will be able to do more promotions for our customers as well as bring on some additional staff to help with the day to day operations. As for expansion I would really like to just stay in the Magic realm of collectibles, and becoming one of the leading websites people turn too when it comes to getting affordable MTG cards. MTGR : Bret, it was very cool to yatter with you. One of my kids wants the computer to do watch viral vids, do homework or something so I'm going to have to sign off with you. Thanks for your time today with the interview and the best of luck with Magic on a Budget. MoaB : Thank-you for arranging this. MTGR : I'll send some maple syrup and back-bacon down to you. Good Night. Good Monday Morning MTG peoples. As MTG Realm is only an hour north of Toronto, we should yatter about the recent Grand Prix Toronto event which went down this last weekend at the International Center. The format for this was Scars of Mirrodin Sealed Deck / Booster Draft. For information on this event, check out the info post here. Let's cut to the punch line first - Canadian Jon Smithers is your GP Toronto Champion! Congratulations, Jon! Players we know indicate the event was a solid success with approximately 1,400 players competing. The only bit of turbulence we heard was Mark Zadjner being escorted off the premises for threatening one of the judges. Mind you, this is still rumour and could not be immediately confirmed. There was also a complaint about the late start to the tournament and the horrible sound system used. Some of the great cards Jon pulled for his sealed deck included Molten-Tail Masticore, Tempered Steel, Steel Hellkite, Kuldotha Phoenix with good support from Ferrovore and Origin Spellbomb. Across the final table from Jon was Brad Nelson who had performed well with help from Panic Spellbomb, Glint Hawk and Tumble Magnet among others. The final match went to game three with Jon being able to equip a Livewire Lash to his Skithiryx, the Blight Dragon. Jon swings with the help of a Sieze the Initiative to ensure enough poison counters were placed on Brad for the win. You can watch the match on GGSLive. Finally, we have from MTG Mint Card, a list of their top-10 selling cards for October. 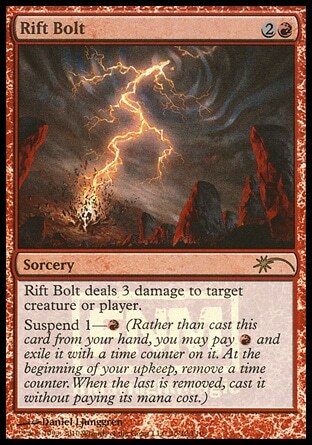 Three weeks after the Scars of Mirrodin release, these cards look to be the popular cards in standard. Right now in where we live, the city is covered in a blanket of (very temporary and ephemeral) snow. Perhaps this may be the case in your neck of the woods. If so, give yourself some extra time to head off to your local game store / club for Friday Night Magic to avoid being late and getting the stinkeye from the organiser. Today's post . . . light 'n' fluffy. We are providing some images of some very lovely swag sent by Wizards of the Coast to some of the fan sites they work with. Check it out - the absoutely bomb-tastic Mirrodin lunchbox ! Text from the letter included reads like this . . This is the plane of metal. The Razor Fields chime with the sound of the golder blades of grass waving in the wind, and the rippling surface of the Quicksilver Sea reflects the gleaming light of the five suns. This plane is about to be a battleground. The tribes of Humans, prides of Leonin and other Mirrans carry on with their lives as if nothing is wrong. Event the industrious little Myr are oblivious to the poison brewing just beneath the seemingly peaceful world. 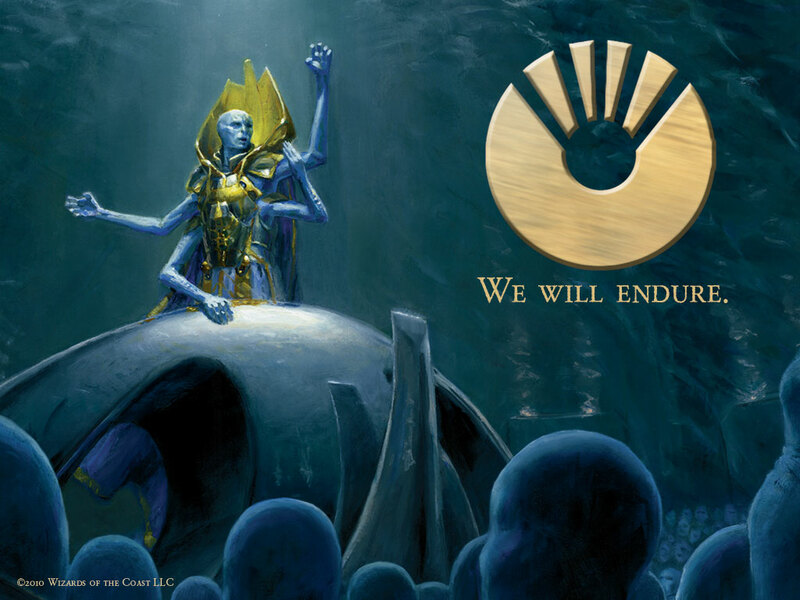 The Phyrexian invasion force has been growing within the world since its first dawn. 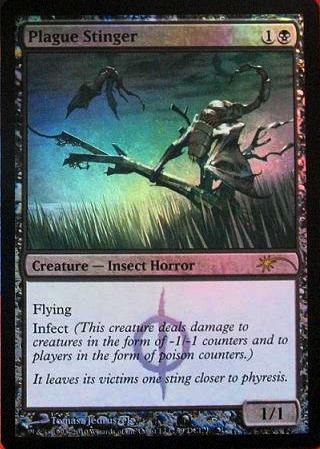 Now, Phyrexia seeks to re-make this world in its own twister image of perfection. Before you, you'll find the tools to explore the looming conflict and choose the side with which to ally yourself. Will you aid the Mirrans in the defense of their home, or will you side with the Phyrexians and their desire for conquest? Look around for like-minded friends, or better yet, opposite-minded friends to engage in battles at work during lunch or at your favourite game store. These Magic the Gathering Scars of Mirrodin Intro Packs introduce you to aspects of either faction and the booster packs let you delve even deeper into the plots and machinations of all involves. 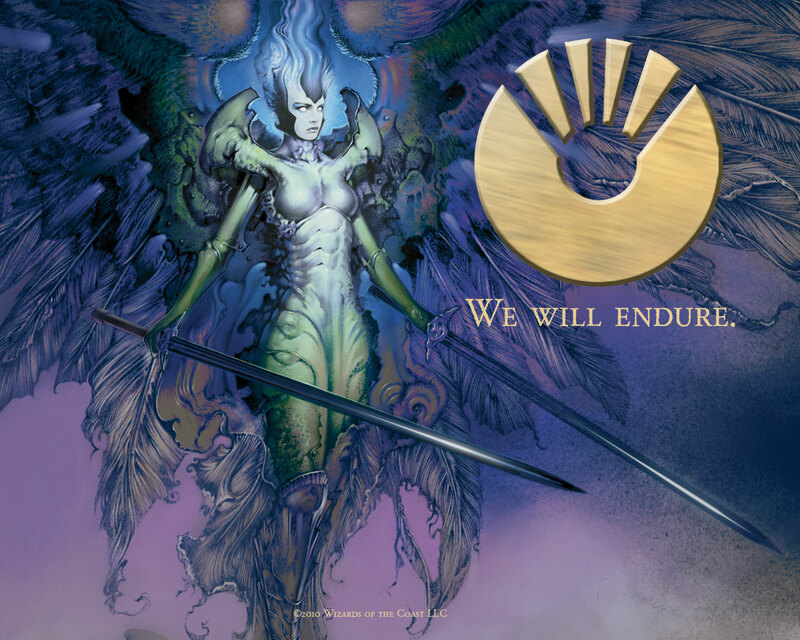 The website below will give you even more insight into the Mirrodin and the Phyrexian invaders. If KFC's Double Down can push droves of consumer's to rave reviews, how difficult would it be for Wizards of the Coast to sell you a fatter Fat Pack ? 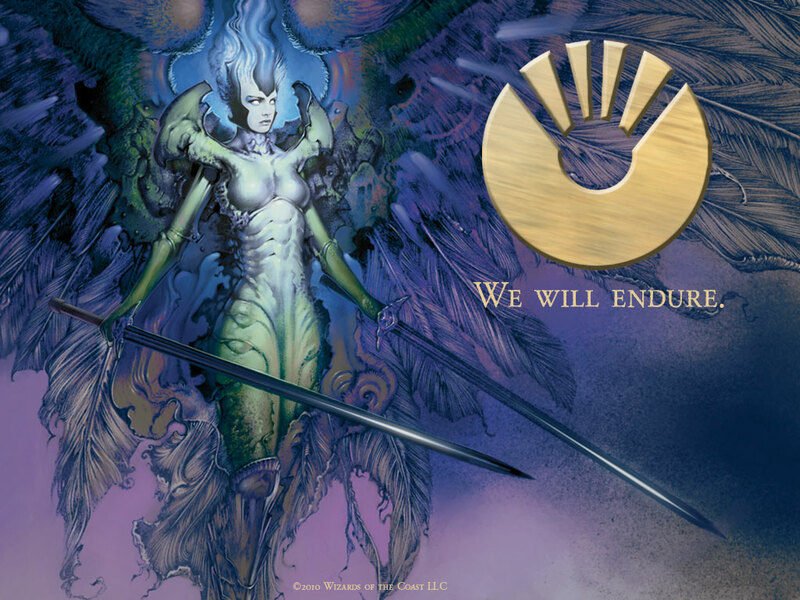 We will certainly see when Mirrodin Besieged is on 4th February, 2011. 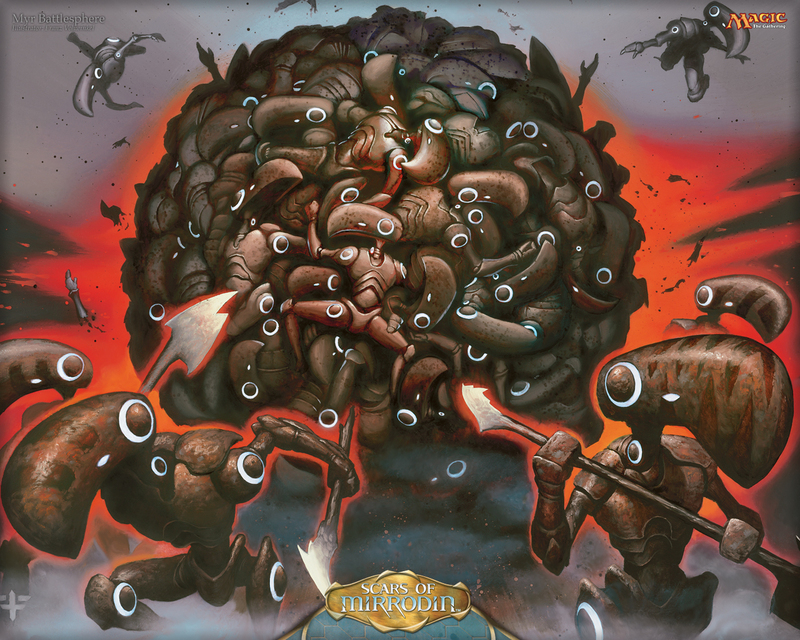 MTG Realm has reviewed the latest Sales Solicitation flyer from Wizards and now brings you the reader some highlights . 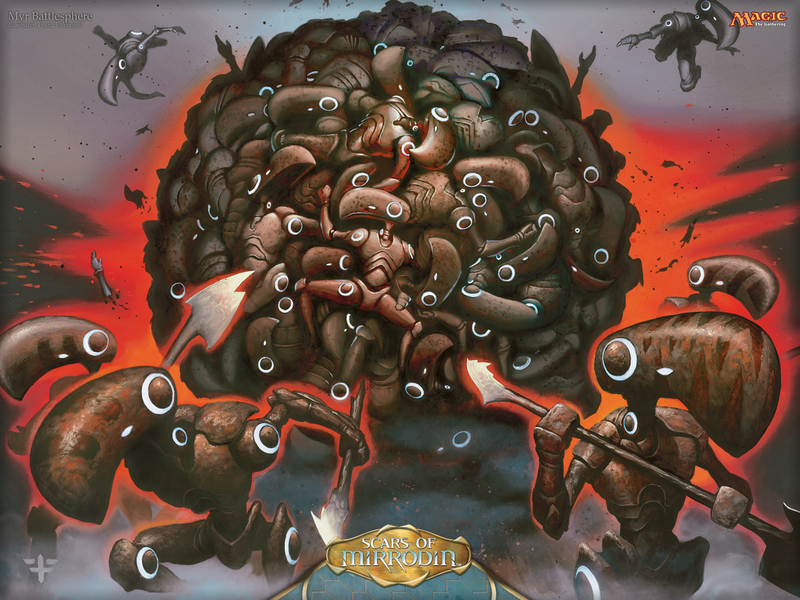 . .
NEW FAT PACK: The classic Magic Fat Pack receives a new configuration with the release of Mirrodin Besieged. Fat Packs will now contain nine boosters (instead of eight), 80 land cards (instead of 40), a Spindown™ life counter, a player’s guide, a card storage box, and two 60-card deck boxes. 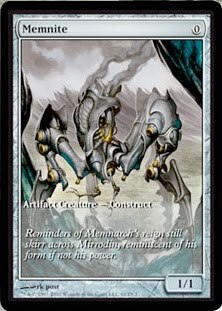 NEW EVENT DECKS: New with Mirrodin Besieged are Event Decks. These 60-card decks come with a 15-card sideboard and are perfect for use in Standard play tournaments like Friday Night Magic or Game Day celebrations. They also come with a Spindown life counter and a reusable card box. 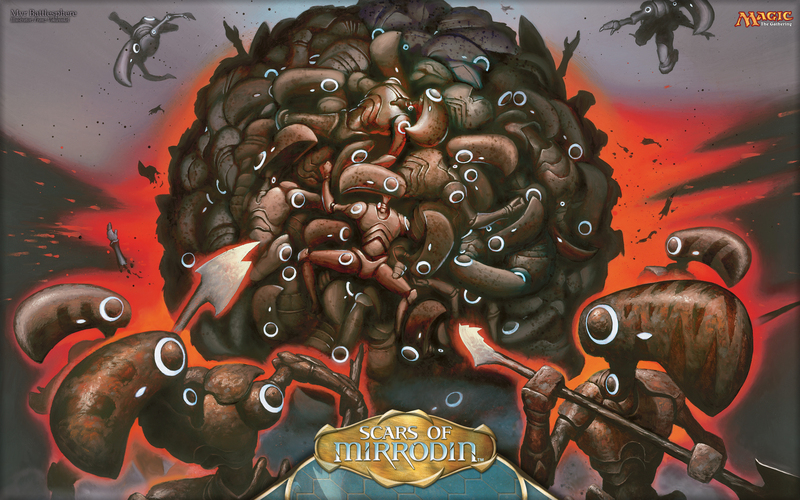 Please note: The two versions being released for Mirrodin Besieged will be released on February 25, 2011 – just in time for Game Day! INTRO PACK DISPLAYS: Unlike previous sets, there will only be four versions of the Intro Packs for Mirrodin Besieged (normally, there are five versions). 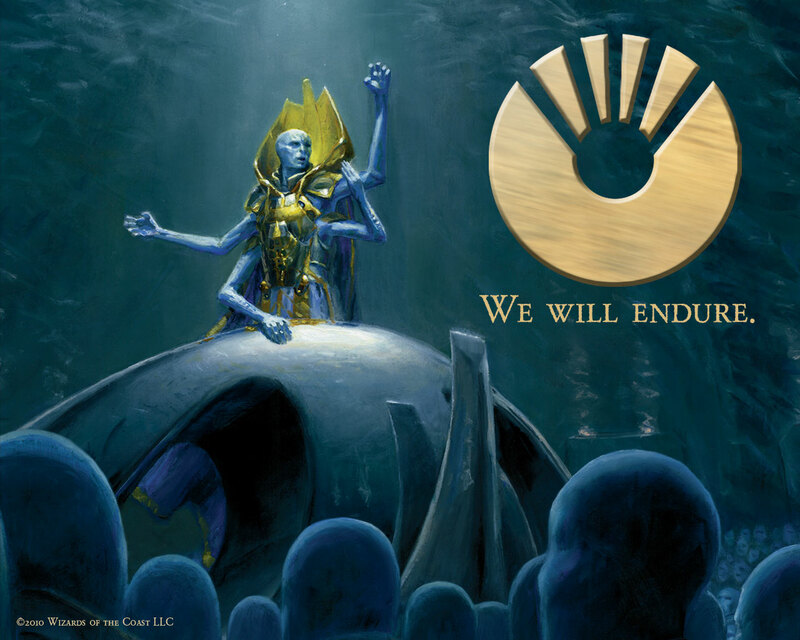 There will be two decks to represent the Mirran faction and two decks for Phyrexia. 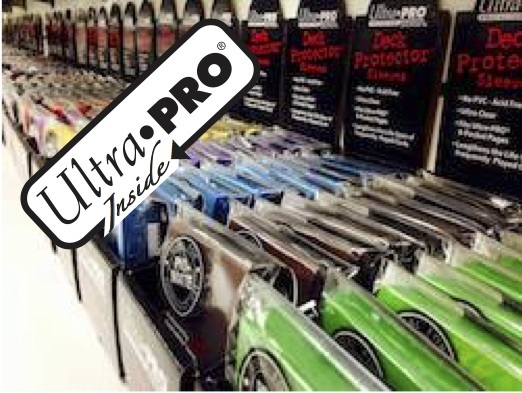 The displays will still contain ten decks – two of each type plus two more selected at random. 8 boosters, 1 card box, 1 player’s guide, 1 40-card land pack, 1 learn-to-play insert, 1 Spindown™ life counter. 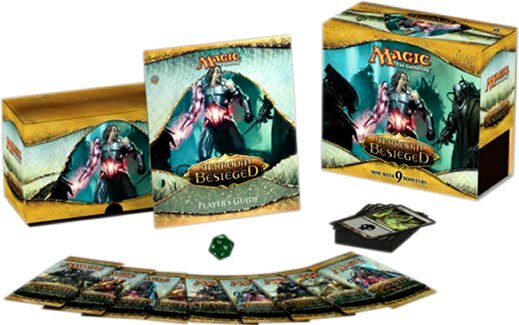 9 boosters, 1 card box, 1 player’s guide, 1 80-card land pack, 2 60-card deck boxes, 1 Spindown™ life counter. Are you getting value with the extra $5 you will be paying ? Considering the additional lands (we don't really care about), the extra booster pack (yep, we like) and the two deck boxes (we'd have to see 'em first), we think we like the deal. Although this site is dedicated to standard environment casual magic, we certainly do not limit ourselves to having a look at what the Pro's or serious Magic players are brewing up. 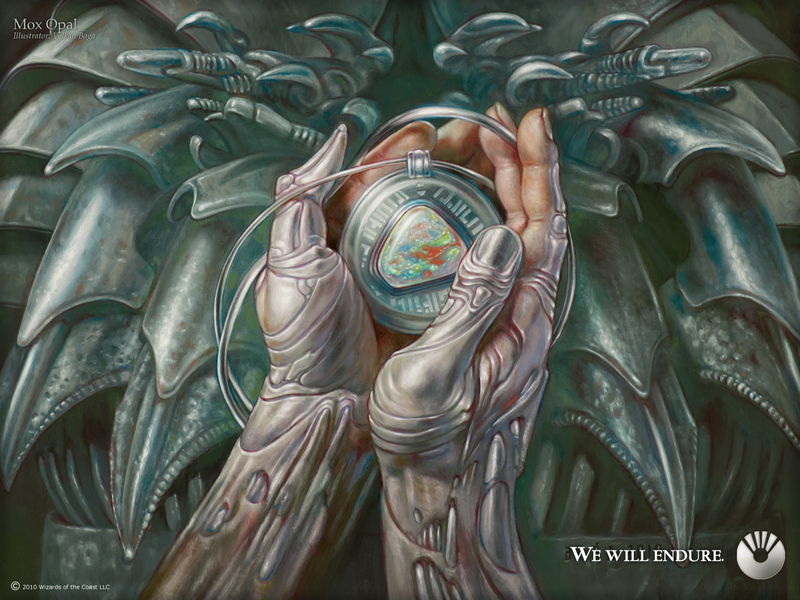 Today, we would like to do a very brief review of the recent Magic: the Gathering State and Provincial Championships, also known more commonly as the ' 2010's '. Sunmesa really needs to register a few more domain names as they still appear in the 2009's. btw - they also have a FaceBook page. From reviews of TCG Players and StarCity Games websites and results, we can provide a summary of what hot and what's not at the standard format tournament scenes. We suggest you head on over to ManaNation and check out some of the first place finishers. First up, here is the list of the Top Twelve deck archetype finishes from all those tournaments. We suggest you go on line and determine what cards make up the above builds. For now, here is an not very concise list of what cards (on average) make up the top 3 decks . . .
Well since we are yattering about popular builds, we might as well provide a list of the Top 30 most played cards (mana / land cards not included) in all the decks played . . .
Lastly, if you are seeing any cards in the above list that is not yet in your collection, click on over to MTG Mint Card - you might as well take advantage of their 5% discount coupon - details on their Facebook page. Here at MTG Realm, we like to push away from the game table and have a look around from time to time to see what is happening now strictly with our favourite card game but what may be happening on the peripheral to the game. To this end, we have some short tid-bits of news 'n' updates - we start with the overseers of Wizards of the Coast or rather their corporate masters, Hasbro . .
Iron Man and board games such as Operation, Scrabble, UBuild, Bop It, and games based on Toy Story 3 were also cited as strong performers in the quarter. Next up, books you can get at your local bookery shoppe . . .
MATTHEW STOVER (Author) In Stock. This title will be released on April 26, 2011. Mirrodin - a world of living metal, an artificial ecosystem created by the Planeswalker Karn to support organic life—is on the cusp of cataclysm. 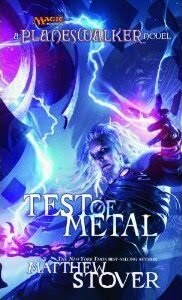 When the Planeswalker Venser goes in search of his former mentor, he learns Karn’s life hangs in the balance—and with him the entire plane of existence. 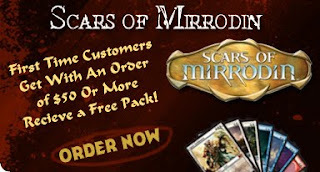 For fans of the mega-selling trading card game, Magic: the Gathering®, the full story behind Scars of Mirrodin, a revisitation one of Magic’s most popular settings. As MTG Realm is a casual Magic the Gathering fan site, we know that your fav game may take you to a great number of varied locations such as your kitchen table, your school cafeteria, your work's lunchroom or even on-line. 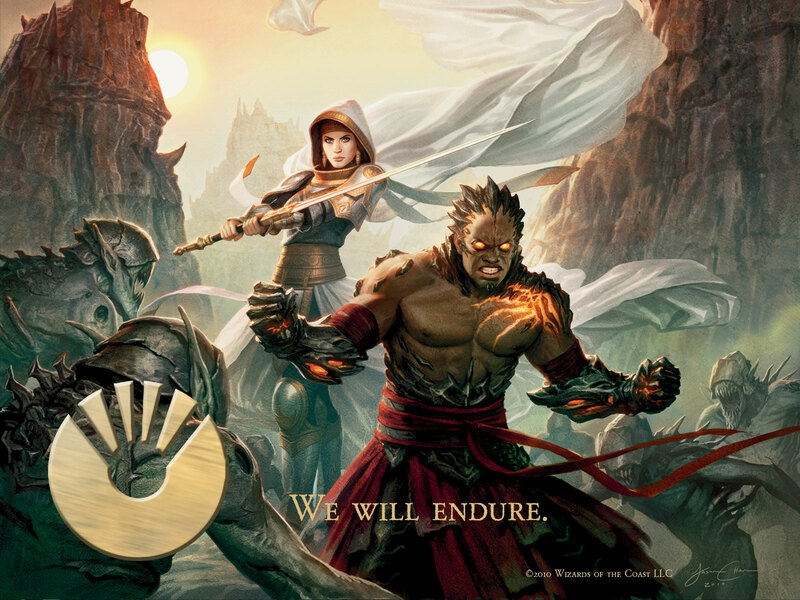 We also know from your eMails and correspondence that a great number of you also participate in a number of Wizards Play Network (WPN) sanctioned events, whether it is the very popular Friday Night Magic (FNM), a booster draft or Elder Dragon Highlander (EDH) at a variety of locations. WPN sanctioned events are excellent because you get a chance to win some cool, alternate art foil card or other excellent prize. The three main programs in WPN (Gateway, Core, and Advanced) had just recently changed on Friday, 15th October - and perhaps not for the best according to some players. 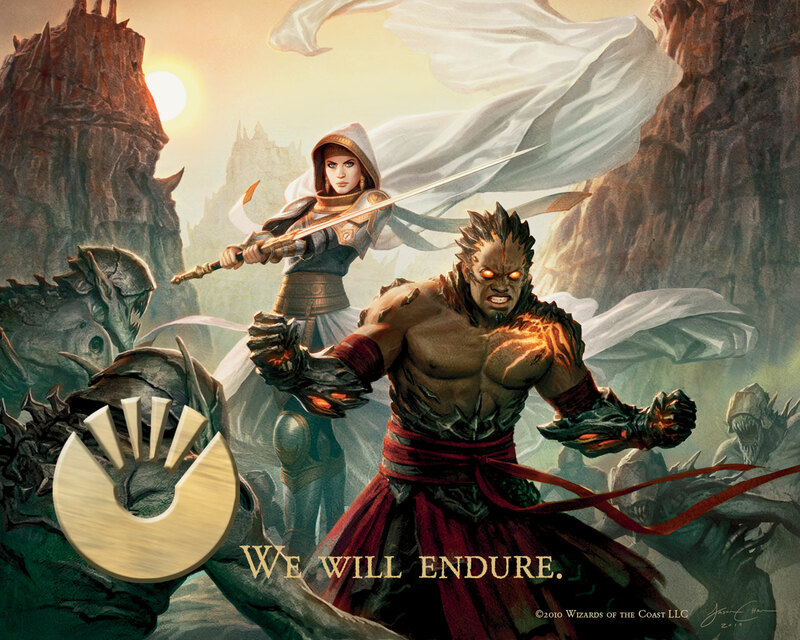 In the past, Wizards of the Coast, through the Wizards Play Network provided stores, schools, libraries, and organizers everything they need to set up and maintain vibrant gaming communities. It has now changed to just stores with some qualifiers . 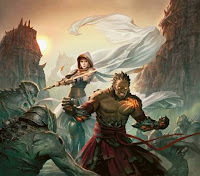 . .
"Wizards of the Coast wants to build strong ... Magic communities in stores; attaching WPN levels and programs to retail venues creates a greater connection between players and the stores where they play. This change allows Wizards to better leverage the strengths of the WPN and our programs, maximizing their impact for stores and promoting the formation of vibrant player communities." So, essentially, Organizers will no longer have WPN levels, and organizers will no longer receive WPN programs. Both these will be given exclusively to store locations. 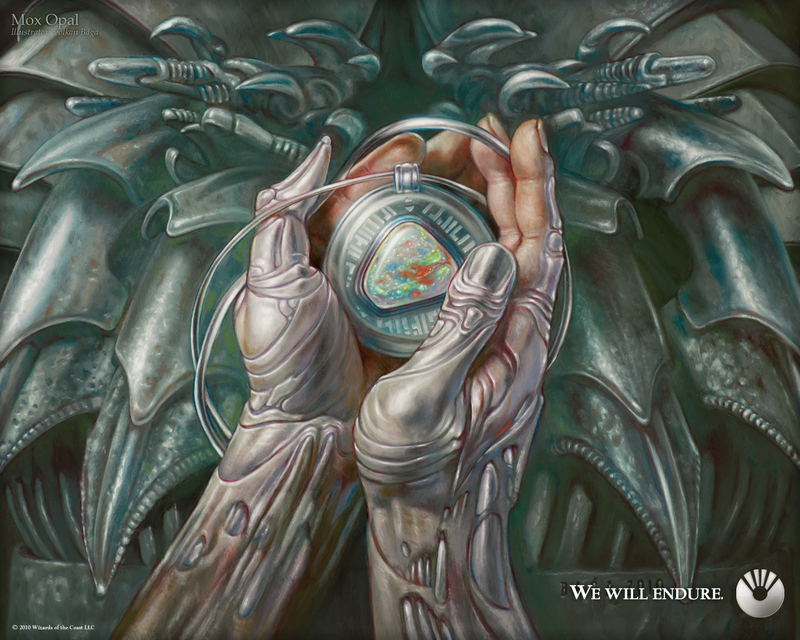 We here at MTG Realm want to know if this may affect you and where you play. Do you have a club at school, in the armed forces, at your local library that formerly enjoyed WPN programs or does this affect you at all - perhaps you only play at a local games store - drop us a line in the comments below. Speaking of WPN promos, here are / were the latest FNM and Gateway promos . . .
Today's article has been left by the side of the road as we had waaaay to many Butterbeers and Pumkin Juice drinks last night at The Three Broomsticks. Things got a bit more fuzzy after moving to The Hog's Head where Firewhiskey was imbibed at an alarming volume. To this end, we bring you something which will not require too much thinking on our part - we hope a clearer mind will present itself during Friday Night Magic latter tonight. That's all folks, if you're heading out to a local FNM or just hanging with some friends at the kitchen table, have a blast, otherwise have a great weekend.